One of my parents' friends in Danville, Pennsylvania was reading our site, and suggested that I experiment with some homemade Italian liquors and cordials. 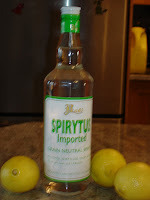 He was kind enough to provide some instructions on how he had prepared homeade limoncello. When I heard this, I knew that I had to make my own limoncello right away. I spent a couple weeks travelling around Italy after graduating from Haverford College. One of the things I remember about Italy (other than its friendly people, natural beauty and that I want to go back with my husband) is the incredible Italian food. While in Italy, I remember coming across two after-dinner drinks with some frequency - Limoncello (a sweet lemon-flavored liqueur) and Grappa (which I am told tastes like gasoline, but with that description, coupled by a smell to match, I never tried Grappa). I brought home several small bottles of wonderful Italian limoncello, unaware that it would be a fairly simple process for me to make my own. Because Italy is such a romantic destination, and limoncello is the perfect sweet ending to a romantic dinner, such as a Valentine's Day meal, I decided to include this in our Valentine's Day Special. A further note: they have wonderful Italian after-dinner cordials (after a great Italian meal) at my favorite New York Italian, Acappella. By way of background, limoncello is an Italian lemon liqueur, produced mainly in Southern Italy, such as in the Naples area and the Amalfi Coast. Traditionally, in Italy it is made from Sorrento lemons, but ordinary lemons (like I used) will also produce an excellent quality limoncello. The process of making limoncello is quite simple, but takes about a week. First, peel the 20 lemons. Put the peels in a large jar, or a 2 liter soda bottle. Make sure when peeling the lemons to use a regular peeler and not a zester, and remove only the peels. Then, add 1 liter of everclear, or another type of grain alcohol to the lemon peels. Put in a dark closet for a week, turning the bottle or jar upside down once a day. After a week has passed, remove the yellow liquid from the lemon peels. The peels should have whitened considerably in color, and have a brittle feel to them. Filter the liquid through a coffee filter and put aside. To prepare the simply syrup, put the water in a pot and add the sugar. Heat and stir until the sugar is fully dissolved, around a temperature of 115 degrees. At this temperature, add the syrup to the yellow everclear lemon infusion. 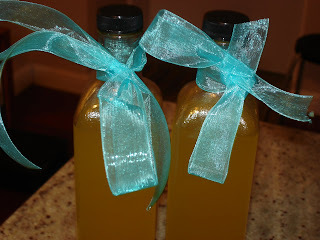 If you add the syrup when it is warm, the limoncello will be a clearish yellow color, and not cloudy, which would be the likely result if the syrup were allowed to cool first. At this point, you have successfully extracted and made your own Italian limoncello, the perfect after dinner cordial for with a sweet dessert for Valentine's Day. 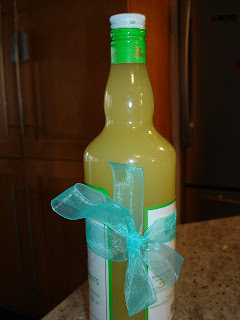 You can order some 16-17 oz bottles from Specialty Bottle in whatever shape and size suits you, bottle the limoncello and decorate with a pretty ribbon. This makes a great gift. My bottles haven't arrived yet, as I ordered them a bit late in the process, so the picture is shown in a large bottle. I will update the photos early next week when they are bottled for gifts! So here they are finally - the bottles that I ordered with the Limoncello. This makes the perfect gift - my mother in law loved hers. If life gives you a lot more lemons, check out the following post from Margie's Kitchen on Boston for many wonderful and inspired ideas on how to cook with lemons. If life gives you limes instead, try my recipe for Key Lime Bars. Love this! I fell in love with Limoncello back in Italy and I'm on a make-stuff-from-scratch kick. I'm excited to add it to my repertoire.